“Welcome in Africa.” That’s what everyone says here. Welcome in Cairo. Welcome in western desert. Welcome in Egypt. 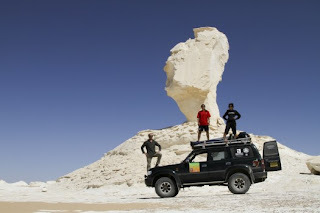 After about 6000 miles (our odometer is a bit temperamental), we have arrived in on the continent of Africa. We drove like bats out of hell from London onward. Eyes on the prize, we were desperate to get to Egypt so that Kickabout: Africa 2010 could (officially) commence. England, France, Italy, Greece, Turkey, Syria, and Jordan were almost blurs in the “Warthog’s” windshield. As we raced through Europe and the Middle East, a voice in the car longingly call out “piiiitch” every time we passed soccer fields and goals, knowing full well that we didn’t have time to stop and play. Yet, we did take a few moments to play. We met incredible people, made new friends, and never met someone who did not want to kickabout when the ball emerged from the car. A family we met in Turkey on their way to Austria FROM South Africa. The adorable kids of Cappadocia that you met in an earlier post. A cobbler in Istanbul who played with us in his high-end shoe store and the oblivious customer who entered the shop mid-play and took a kick at it. The Jordanian who didn’t think women were capable of keeping up with men on the field. Lorrie schooled him. He blamed his smoking, of course. A teenage Bedouin boy on a towering rock overlooking the High Monastery of Petra. A customs officer dressed in fancy dress shoe at the Nuweiba port of entry into Egypt. Nothing gets you through security like a football. We have seen enough that we could go home now, and the trip would be a story of stories. We’ve witnessed a 9-goal match at Stamford Bridge, played keepy-up at The Coliseum, walked through the dressing room of AC Milan, wandered the streets of Damascus, haggled over the price of a soda in the Sinai, and rode a donkey at Petra. And then there’s the Story of Batch and Erdall. 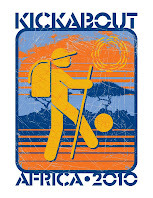 Yes, the last two months have been a precursor; the pre-season for Kickabout: Africa 2010. But we have already been blessed with seeing the many faces of football. We are amazed at the power a round ball has to open doors, raise hopes, release a smile, and bring strangers together. As we are welcomed in Africa, we thank all of our new friends , young and old, that have fueled our mad dash to Egypt. Without a doubt, our Kickabout family spans from London to Cairo. 4 comments: on "One World, One Game, One Journey"